ROSS, JOHN, army officer; fl. 1762–89. He may have married the sister of John McDonell* (1750–1809). 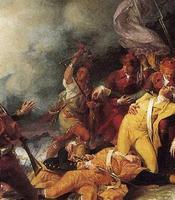 John Ross was commissioned lieutenant in the 34th Foot on 31 July 1762. His regiment served in the attack on the Spaniards at Havana, Cuba, in 1762, in West Florida from 1764 to 1768, and in Ireland in 1769. In December 1764 Ross was sent from Louisiana to Fort de Chartres (near Prairie du Rocher) in the Illinois country, where he was received by Louis Groston de Saint-Ange et de Bellerive, the French commandant. The first British officer to enter the area after the peace with France, Ross was to attempt a reconciliation with the Indians there, but he found them hostile to British occupation of their lands. After a few months he returned to New Orleans. During this expedition he made a map of the route up the Mississippi River to Fort de Chartres which was later published in Thomas Jefferys, The American atlas (London, 1778). Ross was promoted captain in the 34th Foot on 14 March 1772. In 1776 the regiment was part of the force sent to drive the Americans from Canada, but the exact nature of Ross’s early service in Canada is not known. In July 1780 John Ross, described as a “veteran officer of high reputation,” was given the temporary rank of major to raise a second battalion of the King’s Royal Regiment of New York (KRRNY) at Lachine and was sent with it to work on construction at Coteau-du-Lac, west of Montreal. In September Governor Haldimand arranged that Ross and the 2nd battalion KRRNY would occupy Carleton Island (N.Y.) to maintain the essential link between Montreal and the upper posts. Ross arrived there on 30 Nov. 1780 with 100 men, after Haldimand had learned that the Americans were planning to seize the island as soon as winter ice made the river crossing possible. “Enterprising and resourceful,” he fortified the island during the unusually mild winter. When navigation opened on 2 April 1781, provisions were sent to the upper posts. In October 1781 Ross took a force composed of troops from his garrison and from Fort Niagara (near Youngstown, N.Y.) with a few Indians on a raid against the Mohawk valley. Advancing by way of Oswego and Oneida Lake, Ross was hampered by bad weather and inadequate support from the Indians. The troops fought a successful action at Johnstown against a larger and better armed force of American militia. However, Ross was forced to withdraw before the operation was completed. During the orderly retreat to Carleton Island Walter Butler, commanding the ranger detachment, was killed. That winter Ross built Fort Haldimand to protect the twin harbours of the island. In February 1782 Haldimand ordered him to occupy Oswego when navigation opened, and he arrived there on 15 April. Commanding about 500 men from Carleton Island and Fort Niagara, Ross gained Haldimand’s admiration by the speed with which he fortified his new post. 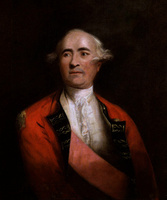 He was promoted major in the army on 12 June 1782. In July 1783 Ross was sent to Cataraqui (Kingston, Ont.) to arrange for the settlement of loyalist refugees. He wintered there with an advance party of the KRRNY, constructed barracks amongst the ruins of old Fort Frontenac, and built saw and flour mills. 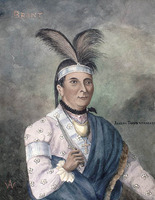 Ross recommended the purchase of land in the area from the Mississauga Indians and the construction of a fort on nearby Point Henry, and he established a navy yard on Point Frederick. In October 1784 Ross sought permission to return to England to attend to his aged, infirm father, and he arrived in London from Quebec on 23 April 1785. He was promoted major in the 34th Foot on 20 May. The following year, when he was back in Canada, he was arrested as a consequence of accusations by his second in command at Cataraqui, Lieutenant William Tinting, whom he had charged with a malicious attempt to injure his reputation. Ross was exonerated and given the command of the 34th Foot in Montreal in August 1786. The regiment returned to England in 1787. Ross retired from the army on 17 Feb. 1789 and sold his commission. Details of his later life, descendants, and death are not known. BL, Add. mss 21786. PRO, CO 42/18, pp.148–51 (copies at PAC). Kingston before War of 1812 (Preston), xli-xlvii, lii-lv, 21–46, 69–71. Orderly book of Sir John Johnson during the Oriskany campaign, 1776–1777 . . . , ed. W. L. Stone (Albany, N.Y., 1882), 56. Scots Magazine (Edinburgh), 1789, 155. The settlement of the United Empire Loyalists on the upper St Lawrence and Bay of Quinte in 1784, a documentary record, ed. E. A. Cruikshank (Toronto, 1934; repr. 1966). G.B., WO, Army list, 1788, 110. William Canniff, The medical profession in Upper Canada, 1783–1850; an historical narrative with original documents relating to the profession, with some brief biographies (Toronto, 1894), 457. Richard Cannon, Historical record of the 34th or Cumberland Regiment of Foot (London, 1844), 34–37. Graymont, Iroquois, 247–48. J. R. Simms, Trappers of New York; or a biography of Nicholas Stoner and Nathaniel Foster; together with anecdotes of other celebrated hunters, and some account of Sir William Johnson, and his style of living (Albany, N.Y., 1871), 94–95. E. A. Cruikshank, “The King’s Royal Regiment of New York,” OH, XXVII (1931), 231, 234–35, 241–42, 253, 266, 271–80, 293–318. Richard A. Preston, “ROSS, JOHN (fl. 1762-89),” in Dictionary of Canadian Biography, vol. 4, University of Toronto/Université Laval, 2003–, accessed April 21, 2019, http://www.biographi.ca/en/bio/ross_john_1762_89_4E.html.